St.St. 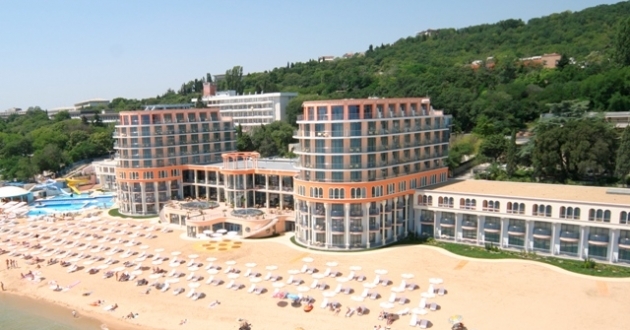 Constantine and Helena is the oldest resort at the Bulgarian Black Sea Coast, situated 8 km Northwards from Varna. The first balneology center here had been established in 1908. The resort owes its popularity to the unique combination of numerous green parks, mineral waters, beaches and sun. The resort has its name after the St. St. Constantine and Helena Monastery, situated on the territory of the resort. It had been established in the beginning of XVIII century, in the honor of the Roman Emperor Constantine I and his mother Empress Helena. Now, only a small church had left from the monastery, half dug in the ground. We could give you lots of reasons to visit the resort. The air is very clean, because of the high concentration of negative ions. There are mainly evergreen cypresses, cedars, aromatic fig-trees and lilac in the parks. The beaches are located in calm gulfs, with golden sands and curative mineral waters. There are lots of hotels in the resort: most of them are new, some are after renovation and restoration, and there are villas and recreation centers. 2 outdoor swimming pools with hot mineral water are working around the year. The resort offers a big variety of restaurants and places for entertainment for adults and children. There are regular buses from the resort to Varna. The hotel is situated directly on the beach.